At BAYADA Home Health Care, we are dedicated to helping people have a safe home life with comfort, independence, and dignity. 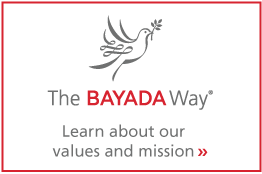 We accomplish this with a strong commitment to The BAYADA Way from all of our employees. The stories that bring us together are as unique as the people telling them, and that is what “My home health care story” is all about. We would like to take this opportunity to invite you to share your own home health care story. Send an email to the BAYADA DIG office at socialmedia@bayada.com. Tell us what led you to work in home health care and why it’s such gratifying work. If your story is chosen, we will publish and share it on our website.